Two people showed up yesterday morning to work in the Park for our weekly Monday morning clean-up day, Park Committee members Steve Elmore and Rebecca Kerimbaev (Park Chair Sheri Kennedy was out of town on vacation). We were a little disappointed at the turnout, but that’s okay – we know you guys will turn out sooner or later this summer! We were happy to have neighbors Sharon LeMaster and Geoff Seamans show up to help me, Steve, and Sheri two Mondays ago on June 27, our very first official Casual Monday of the summer. So what did we do yesterday morning? Steve spent his time helping to prepare the W Ponce face of the Park for planting in the fall. He removed one smallish understory red mulberry tree that was stunted and not getting enough light. 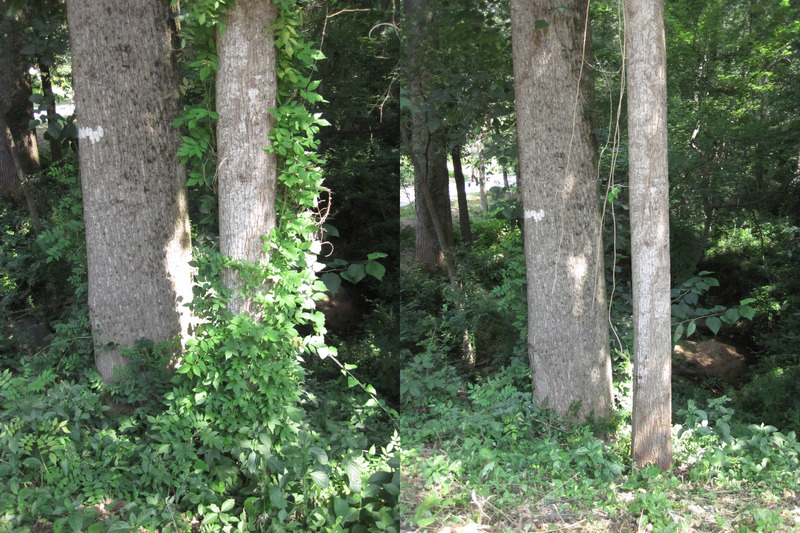 There are 3 other small understory trees slated for removal from the area of the Park facing W Ponce. These trees either have branches that are hanging too low over E Parkwood Rd. or they will never have enough sunlight where they are to grow to their full potential. Their removal will also allow for the planting of size- and light-appropriate native understory trees and shrubs this fall, when we begin to repopulate this prominent “face” of the Park with all native landscaping. Rebecca worked on the very south end of the Park to remove invasive English Ivy and Chinese Wisteria from several trees there. This very satisfying activity is accomplished by uprooting all the ivy from around the base of a tree and then peeling the lengths of ivy out and away from the tree until the beautiful trunk is again revealed. A similar job can be done with Chinese Wisteria (see below). It’s not just for cosmetic reasons that we want our Park’s trees free of invasive vines. When a tree’s base is visually obscured by masses of invasive vines, the health and integrity of the tree cannot be monitored. Evidence of problems with the structural integrity and stability of large trees often presents itself first at the tree’s base. When a tree is covered in English Ivy or other vines, you can’t see the base — therefore, you can easily miss signs of disease that would otherwise be obvious. This is actually the primary reason for keeping trees free of vines! Another benefit of removing English Ivy is that it often totally obscures beautiful boulders that would otherwise add to the ambiance, dimension, and variety of a landscape. It so happens that our “ravine” has massive boulders scattered like dominos all throughout the length of the stream, even up onto the floodplain, but you wouldn’t know it for all the ivy! 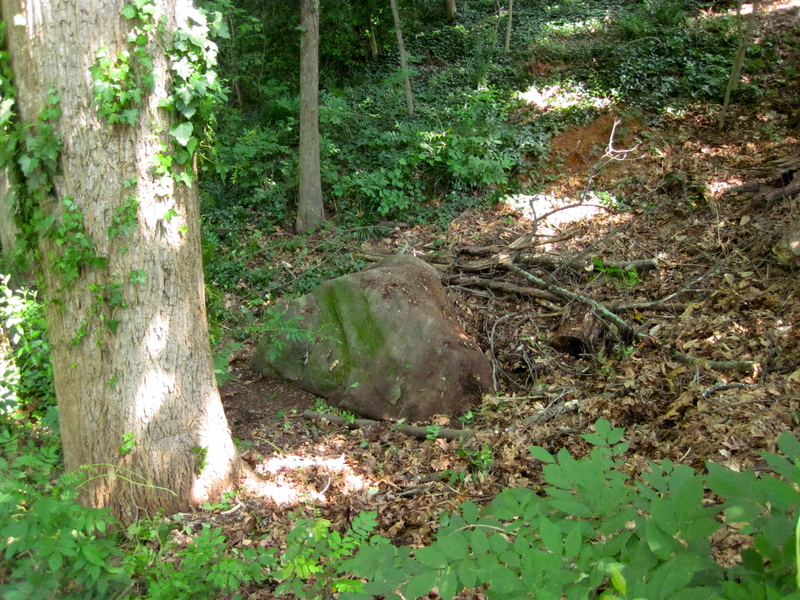 The photo below shows a beautiful boulder uncovered yesterday that was engulfed in English Ivy. Now we can enjoy its beauty and so can the wildlife. Speaking of wildlife, the big brush pile just to the right of the boulder in the photo above provides great habitat for all kinds of important insects, arachnids, and reptiles. Before you say “eww!” keep in mind that without these bugs, lizards, and serpents, we wouldn’t have any birds or wildlife to enjoy in our Park or our yards. They serve important functions in our Park: pollination, decomposition, soil aeration, fertilization, and they are a source of nutrients for other wildlife in the food web. These are the critters that concentrate plant nutrients into rich sources of energy for birds and mammals. They belong here! And they’re beautiful too. 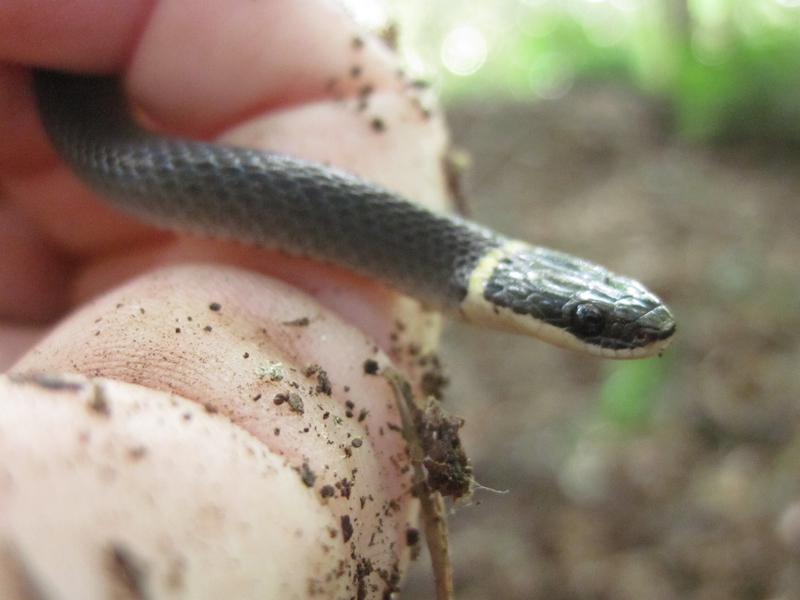 Look at this tiny snake I found yesterday in the Park, a Ringneck Snake, Diadophis punctatus. Harmless to people, this little snake never gets more than 15 inches long. It eats small salamanders, earthworms, invertebrates, other small snakes, and small frogs. There’s a subspecies in the mountains and another subspecies in the Coastal Plain, and ours in the Piedmont is an intergrade between the two. They are gorgeous little snakes with slaty gray, shiny backs and bright, cheerful yellow bellies, with a yellow ring around the neck — hence the name Ringneck Snake. Here’s another small reptile that lives in our Park, one of the 3 species of blue-tailed skink, Eumeces sp. 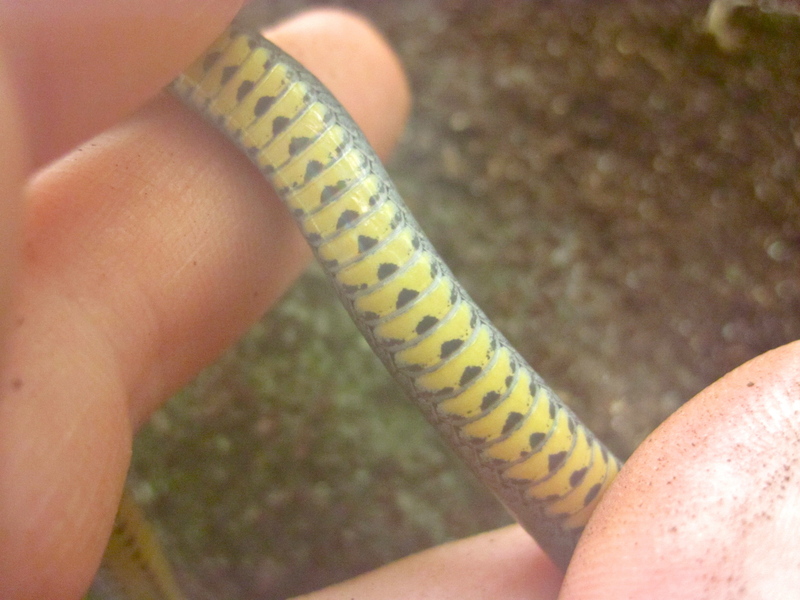 Unlike other local lizards, these 3 similar species of skink all have smooth (not rough) scales and blue tails when young, with 5 yellow stripes along the body. Most of the time, these skinks must be captured to definitively identify to species. 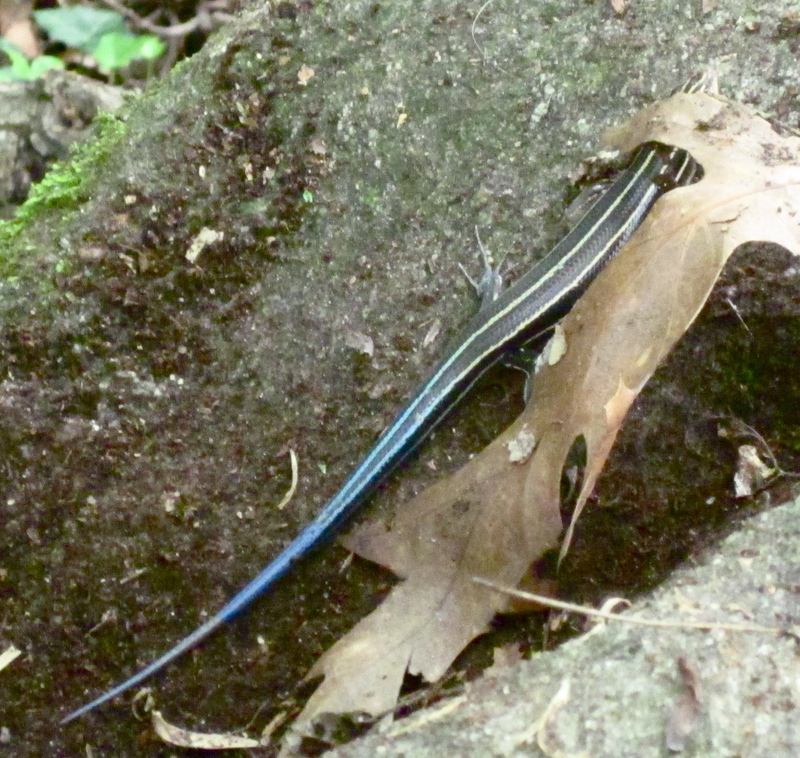 This one definitely would not let me capture it, but is probably a Southeastern Five-Lined Skink, Eumeces inexpectatus. They eat mostly bugs and spiders, and do we have an abundance of those in our Park! Thank goodness we also have salamanders, lizards, and snakes to eat them up! One of the three blue-tailed skinks, Eumeces sp. 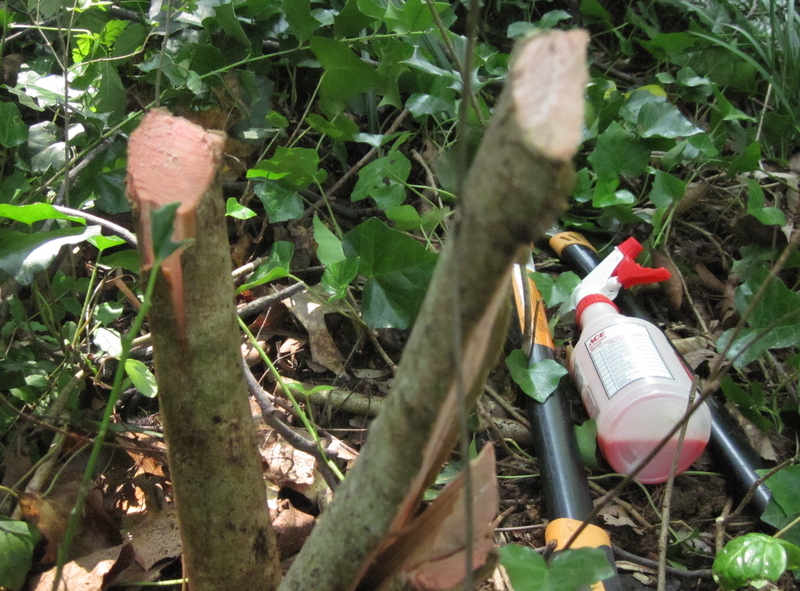 And finally, other than ivy-pulling and wildlife-watching, I (Rebecca) also lopped quite a few more invasive shrubs and trees from around the south end of the Park: some Nandina, Mahonia, Chinese Holly, and Honeysuckle Bushes — all non-native and invasive. A pickup truck-load full of the stuff was hauled away to be picked up by sanitation on my curb. Steve also spent much of his time chainsawing his mulberry into short little pieces for sanitation to pick up. Please join the Park Committee next Monday, July 18, 2011 at 9 a.m. at the cut-through south of Parkwood Park. If you have a chainsaw, you can bring it along and help Steve with more small trees on the north end. Or, you can help Rebecca lop invasive trees and shrubs, pull ivy from trees, and watch for fun and interesting wildlife and birds. There may be other jobs to do too, so please plan to come help if you can, and don’t hesitate to contact Sheri Kennedy or Rebecca Kerimbaev with any questions! This entry was posted in events, Parkwood Park, plants, wildlife. Bookmark the permalink. Great job everyone. Can’t thank you enough for all your hard work. Don’t see myself taking a PTO day to help on a Monday but I (and I’m sure I’m not alone) would love to help. Is there a master plan / punch list that individuals could use to pick off tasks as schedules permit? Thanks, Dan! Let me ask Sheri about this and get back to you.